There are few all-natural, Earth ingredients as potent as the combination of raw honey and beeswax. Science — in all of its glory — has yet to recreate nature’s most amazing ingredients! 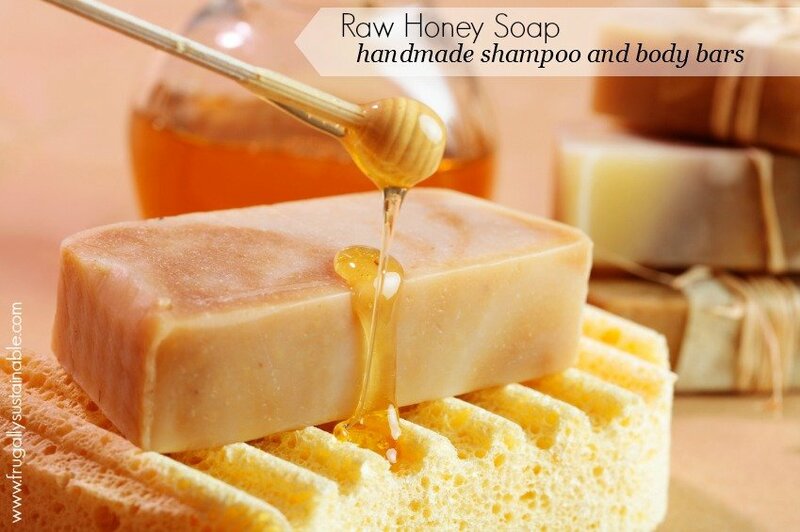 Raw honey and beeswax provide a super effective, germ-killing barrier that improve the health of our skin and hair by locking in moisture and protecting against environmental contaminates. I love combining these beauties in salves, balms, ointments, and now…soaps! Created out of pure ingredients — this bar is scented only by the beeswax and raw honey it contains. It is handcrafted using the hot process method. And when used as a shampoo and/or body bar, it is extremely luxurious and healing. Experience the nourishing and conditioning properties of honey! Measure the oils (withholding the jojoba…we’ll add that later) and beeswax – by weight – and then place in a crock pot to melt on low heat. Once the soap is done “cooking” remove from heat and add the honey and jojoba oil. -Likewise, the tallow used in all of my products is hand-rendered by me and comes directly from a small grass-fed, pastured meats farmer — that I also know personally — in the high mountains of Southern Arizona. *Please use only grass-fed tallow. Click this link for localharvest.org to find a local source and render your own. However, if you are unsuccessful in locating a farmer close to home…purchasing high-quality, grass-fed tallow from U.S. Wellness Meats is a brilliant option! –Mountain Rose Herbs…It’s your one-stop-shop! –Get raw, unfiltered, still-smells-like-honey beeswax here. –Starwest Botanicals also has a beautiful selection of Bulk Herbs, Nourishing Oils, and All Manners of Natural Products for Healthy, Natural Living! Unbelievable..!! I like this recipe it’s very easy and definitely I will try to make it at home. Awesome, Awesome, Awesome..!! Is lye 100% necessary? Seems toxic/dangerous? Yes, the lye is a must in making soap. You can’t make soap without it! After the cooking process, the lye is gone. There is none left in the finished product. Hi Lorie! There’s absolutely no way to make handcrafted soap without the use of lye (sodium hydroxide). Sodium hydroxide is the catalyst for saponification (turning oils into soap). When following recipes and the lye calculator correctly there is no lye that remains in the final product. Our ancestors discovered this ability (soap-making that is) when they made their soap by extracting lye using wood ashes. Handcrafted soap is FAR less dangerous/toxic that commercially-prepared stuff you find in the stores. Just ask anyone who has seen dramatic improvements in the health of their skin! Lye is not not toxic or dangerous if you are careful and follow instructions. Like she said never add water to lye, I can tell you from experience never use aluminum products in soap making. Be careful not to get any on your skin or in your eyes. 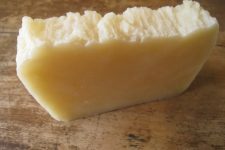 It’s not possible to make soap without lye. And like Andrea said above, properly prepared homemade soap is so much better for your skin than store bought. Do you add the jojoba after cooking? It looks like it, just wanted to clarify. I ran this recipe through a lye calculator and came up with 4.37 using the oils and the beeswax, but NOT the jojoba. Thank you for all you do, this website of yours has become a go-to! Thanks for the great recipe! I began hot process soap making this past Spring, and let me tell you, I am in love with the soap I make. Handmade soap is so rich, creamy, and moistuizing, and the hot process method is lots of fun. Keep up the good work….love your posts! Great timing Andrea, I’ve got the itch to make some more soap. Time to start a supply for holiday gift giving and hostess gifts. Thanks for the recipe. I understand your nervousness. But if I can encourage you by saying…you have nothing to fear so long as you’re careful…then I hope you are encouraged 🙂 One day for sure!!! Mindy – I was intimidated too when I was lookin into trying it the first time. 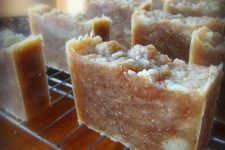 I suggest you look up MistyPrepper – homemade soap on youtube and she walks you through the entire process. Watch it several times so you understand what to do. And try a small batch – you’ll be proud. Lye is not that big of a deal if you respect it. XOXO Andrea! Will place an order soon as I just don’t have time to learn how to make soap! 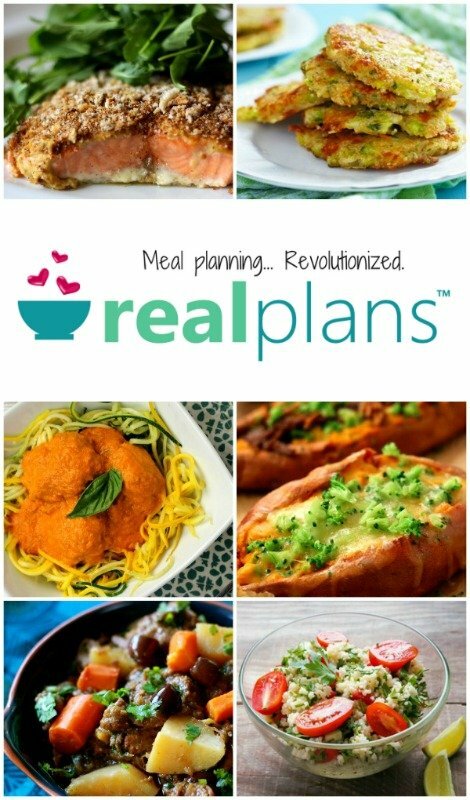 I <3 your products, and that you share recipes! Thank you Lisa! And many, many thanks for your support! Would it be okay if I added some dried lavender to the soap, or maybe rosemary? Or would this throw the balance out of whack? Also, can I assume that you can’t use the crock pot for cooking food after you use it to make soap, or is it okay? Doesn’t the soap gunk up your stick blender? Okay, I know these are probably stupid questions, but I have never made soap before and am a bit curious. Thanks Andrea! A lot of people use dried herbs when making soap, especially to sprinkle on the top. You can also infuse it into the oil and then use the herbs in the soap. Once you use something for soap, it should remain a soap only item after that. So, no, don’t use your crock pot for anything else if you soap with it. The soap doesn’t gunk up the stick blender (unless it’s seizing). I always start to fill my lye container with water after I’m done with it and then I put the stick blender in that water and whirl it around for a bit. Takes it right off! I forgot to say…if you use rosemary in the soap…be careful. It can be quite scratch and rough on your skin. Maybe grind it down like a powder if you use it. That’s what I’d do anyway. 1. The beauty of soap-making is the freedom in creativity that it allows. I love experimenting with new herbs, oils, and essential oils in my handcrafted soaps…I say give it a go. Lavender and Honey soap sounds just lovely! 3. I’ve NEVER had a problem clean my stick blender. And it works perfectly every time. Do I have to use a lye calculator if I use the above recipe as is? Hi Andrea I’d like to omit the tallow so how would I best adjust the othe oils to accommodate this? I don’t have access to tallow here but have used lard before and didn’t like the smell, so would prefer to stick with veg oils. If love to do this but have no idea how to change the other oil quantities. Thanks!! Make sure you run your recipe through a lye calculator every time you change out an oil or butter. Great resources. I have put off making goat milk soap for weeks now. I gotta buckle down and do it. these tutorials are so helpful. Thanks. Can lard be substituted for tallow? Grassfed Tallow will not be available from my local farmer for a month or so and I wanted to try this recipe over the weekend… If lard an be substituted, will the substitution affect the smell, consistency, etc. Hi Vanessa! Lard is a wonderful substitution! I’ve used lard before and didn’t notice any difference in the quality of my soap. However, please be sure to run the recipe through the lye calculator at http://www.thesage.com with the lard instead of the tallow…your amount of lye needed for the recipe may change. I am also curious if there is a substitute for the tallow? Thank you for all your lovely recipes! Tallow’s purposing the soap-making process is to create a hard, stable, long-lasting bar. Oils/fats that accomplish this include: palm (look for an organic, sustainably sourced palm oil), lard, and tallow. Thanks Andrea for linking to me! I want to try this luscious looking recipe! I’ll substitute crisco for the tallow I think (I’ve never made soap with tallow before). Pinned and FB’d this page. Thank YOU Renee! You’re amazing 🙂 Crisco’s a great substitution and I really appreciate the social media support! Can you use the crock pot for both hot, cold and melt and pour soap making? Going to do this when I get some lard! Didn’t realize you could use lard or crisco in place of tallow!! Thank you! Here is another question – can you used coconut water instead of plain water? Is there another oil that can be used instead of coconut? I have a severe reaction to anything coconut…we’re talking anaphylaxis, so I have to avoid it. I’d love to try this recipe cold process with goats milk for a lovely milk and honey soap. Could you tell me how I could do that? 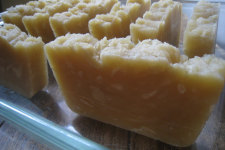 I’d love to try this recipe cold process with goats milk for a lovely milk and honey soap. I make cold process soap, but would like to try hot process in a crock pot. does anything need to be adjusted from a cold process recipe to make hot process soap? You may have to use more liquid as some evaporate when you cook the soap. I’ve used hot process recipes as a guide for oil to liquid ratio to get a general idea to see if I need to add more liquid to a cold process recipe. I hope this helps. I love your article and, I am going to reference this one for my upcoming beauty rituals for a elegant woman. I hope that you make some more glorious beauty recipes so, I can share with my followers. Its amazing on how such simple things each day make a difference in our skin’s appearance. I love your blog! I am getting started with soap making, so feeling rather intimidated. Is this recipe too hard for a beginner? I will substitute palm oil for the tallow, so I ran this through soapcalc.net. I get this amount of lye if I include the beeswax in my calculations. I’ve read that you should mix the beeswax in with your oils. Is there a specific reason you add it after cooking the soap? (Will it make it cook too fast or overheat or something?) I would think it would be easier to melt in with the oils at the start than wait and have to melt it and try to mix it in evenly at the end. I’m guessing there’s something I’m missing here! Laura, I saw your comment. I think you were referring to me re: adding more water for HP vs. CP. Looking at Andrea’s recipe, she uses 10 oz of water and your calculations with your changes are 12.5 oz so I wouldn’t add more than 12.5 oz. As far as the beeswax, I’m wondering the same as you as to when you add it as in her recipe she has it under the “add ins”, but in the process, she only mentions adding the jojoba oil and honey. I guess I’ll run the recipe through the lye calculator with and without the beeswax and see what the lye calculations are that match up with the recipe. Also, I’ve made another of Andrea’s shampoo bars and the beeswax is included before with the other oils. Do you have to use a stick blender? Can you just stir it by hand?